HD video refers to a video of higher resolution than the standard, and most commonly involves a resolution of 1280×720 (720p) or 1920×1080 (1080i or 1080p). Generally coming from Blu-ray, HDTV, HD camcorders, HD videos are usually saved in the formats like MOD, TOD, MTS, M2TS, TS, MKV, etc., which obviously are not compatible with Mac computer built-in video player-QuickTime. Thus, if you need to play HD 1080p/720p video on Mac, either you convert HD video to Mac compatible formats, or free download a HD video player for Mac. 5KPlayer - 100% clean and free HD player for Mac (El Capitan), which can smoothly play HD MKV videos on Macbook Air/Pro, iMac 5K 4K, and other Mac-based computer freely. While HD videos offer us a higher-quality picture, they also torment most Mac users as QuickTime doesn't recognize HD videos, be it MKV, MTS, M2TS, MOD, or TOD. Worse still, your computer's upgrade to the new OS X Mavericks system seems to run salt into your wounds even if you call for Perian or other plug-in to extend the format because these codec packages will not work at all on OS X 10.9, let alone Mac OS X 10.10 Yosemite and 10.11 El Capitan. Does this mean you cannot play MKV M2TS HD Blu-ray videos on Mavericks? To be frank, watching HD videos like AVCHD, M2TS, QT HD and MKV videos on Mavericks is no longer a fond dream. All you should do is to transcode these HD videos to a format viewable by the QuickTime player with a video converter that supports Mac Mavericks. Luckily, MacX Video Converter Pro happens to be the best-in-class HD video converter running on Mavericks perfectly. It excels in converting Multi-track HD video like M2TS, MKV, AVCHD, HDTV BDAV and MPEG-TS to QuickTime supported MOV/MP4 format on Mavericks (Yosemite and El Capitan included as well) without causing any audio and video quality loss. More importantly, speed is never the issue you worry about as this HD video converter for Mac Mavericks makes perfect optimization for HD 1080p and 720p video encoding and decoding, delivering World's No.1 fast converting speed thanks to the Intel QSV hardware acceleration tech aids. Just a few minutes later, you can play HD video on Mavericks anytime. Free download this HD video converter on Mavericks and run it. Then import HD video by clicking "Add File" button. You can also add more than one AVCHD, MKV, M2TS or TS files to be converted at one time. Once you finish video importation, a drop-down box will automatically pops up. 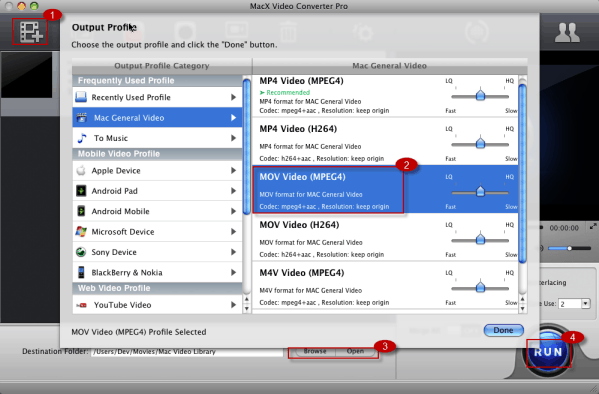 To play HD video on Mavericks, here you can choose QuickTime compatible video format, say MOV, MP4, M4V, etc. Specify output folder on your computer to save the output files. Click the "Browse" button to select a folder where you want to store your converted files. With the above steps done, please click the "RUN" button to begin converting HD video on Mac OS X 10.9 Mavericks-El Capitan. Tips: This HD video converter for Mavericks also makes your high-definition videos more movable. With 320+ codecs and 280+ profiles packed in, it helps to convert and compress 4K 8K Ultra HD video to 1080P video, download YouTube HD video, Facebook 1080P video, Vimeo ultra HD video, Instagram HD video (300+ video sites) to all the latest mobile devices, be it iPhone 6S/6S Plus/6/6 Plus/5S/5C, iPhone SE, iPad Air 2, iPad Pro, iPad Mini 4 (Retina), Samsung Galaxy S7 edge, HTC M10, Sony Microsoft, etc. Therefore, you can play HD videos anywhere anytime. 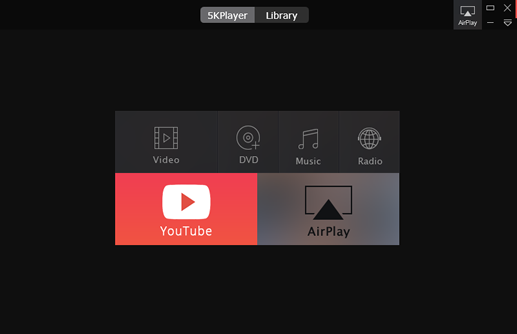 5KPlayer -the world's No.2 downloads HD video player for Mac on Softonic.com, is on par with what we expect from a top Mac video player. See, it's not only 100% free to play HD AVCHD, MKV, MTS, MOD, etc. videos on MacBook/iMac without any plugins or third party, but also play DVDs, MP4, AVI, WMV, FLV, SWF, etc. almost any video audio files on Mac Mavericks to El Capitan. Launch 5KPlayer on Mac OS and click the Video button on the interface window to browse HD video files. You can also drag and drop the Blu-ray video to the UI, which will then be played without blemish. Now, you can eventually view HD videos on your Mac retina computer without format incompatibility issues. By the way, you can also apply this Mac video player to play 4K video, 8K video and 360 degree virtual reality video on Mac. Here is a list of the top free Mac video converter for you to convert among HD and SD videos on Mac OS, like mkv to avi, AVI to mp4 etc; and convert video to your iPhone, iPod, iPad, do not miss this to convert video free with best free video converter for Mac. How to play MTS/M2TS files on Mac free? Wanna share you special moment or wonderful scene shot by HD camcorder with your friend, MacX Free M2TS Video Converter helps you solve the problem, helping you convert HD video files on Mac free. To play AVI on mac, you can convert AVI to Mac MOV MP4 or apply free AVI player for mac to playback AVI movies. Which one is better? Read on to know.